Hang up your coats and dust off your dancing shoes as DJ Rene is in Camps Bay this Spring and Summer. “The Frenchman” takes to the decks at The 41 every Friday night in October. More dates to come for season! 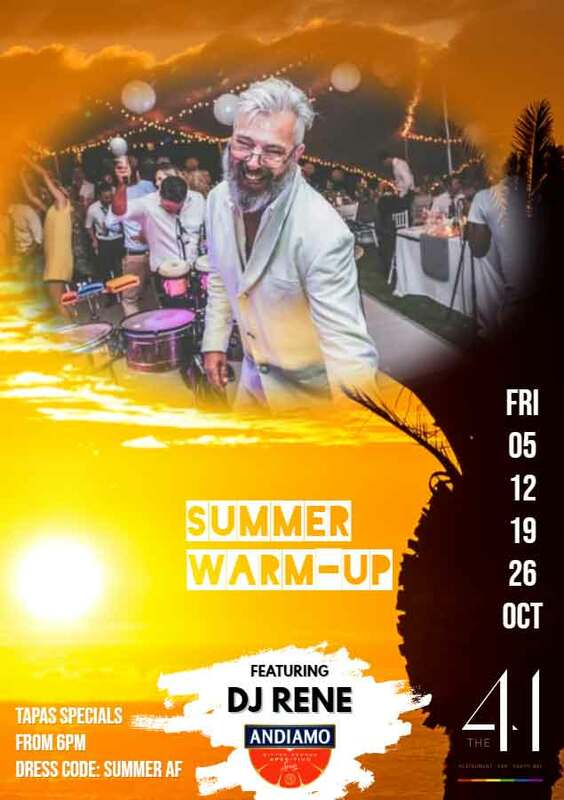 The summer warm-up sessions will offer a scrumptious Sunset Tapas Platter for R 150 to share which includes Smoked Red Pepper Hummus with flatbread, Potato & Parmesan Churros with Chipotle Mayo and Crispy Squid with Sriracha Aioli. 2 glasses of Andiamo aperitivo spritz will be offered with the Tapas Platter. It is a light, refreshing Italian style blend of sparkling wine infused with only the finest imported blood orange bitters. Andiamo is the ideal drink for when the day is waning, and the night is young. A La Carte dinner is also available during the Summer Warm-up sessions. Kitchen closing at 9.30pm. Good music, delicious food and great vibes are all on offer this spring at The 41. From 10 o’clock till late, The 41 will remove its dinning tables to make sure you’ve got space enough on the dance floor for your best choreographies! Call us on 021 437 0558 or email at info@the41.co.za for Dinner, Party table bookings (available from 10pm) & Guestlist.